Atheists are having a hissy-fit over this cross. Police Chief Jeremy Clark has very politely told this group they can take a hike. He’s not going to be frightened by a group of angry atheists from out of state. 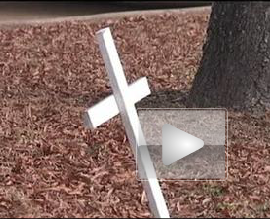 The Freedom From Religion Foundation, however, will continue fighting to have the cross removed. The head of the group suggested that Clark could avoid further trouble by putting it in front of his own yard. He’s not going to do it. The Freedom From Religion Foundation is committed to stripping American of any public display of our nation’s clearly Christian origins. A majority of our Founding Fathers were Christians and they founded this nation on biblical principles. Learn more about the deeply Christian roots of America by purchasing a copy of The Pledge: One Nation Under God by RFC Chairman William J. Murray.